I've been admiring Mutsy strollers for quite some time. The Dutch brand that's been designing strollers since 1937, has recently released a new compact stroller, the Nexo. As you may well know, I adore small strollers, and so I was really looking forward getting my hands on this beauty! The Mutsy Nexo is a smaller brother of the Evo and Igo, and has the distinct, refined Mutsy look. 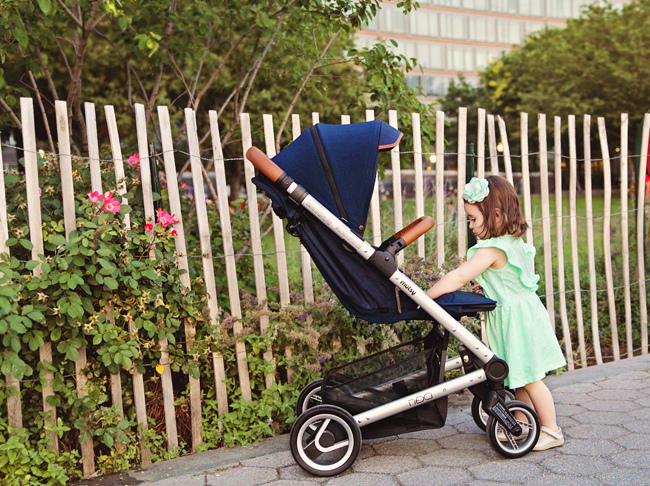 Nexo is a fashionable, petite, stroller with a forward facing seat, small footprint and a super compact fold. 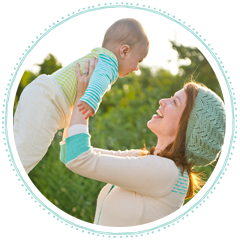 It has all the conveniences of a compact stroller, with the adjustability and some extra features typically found on full size strollers. 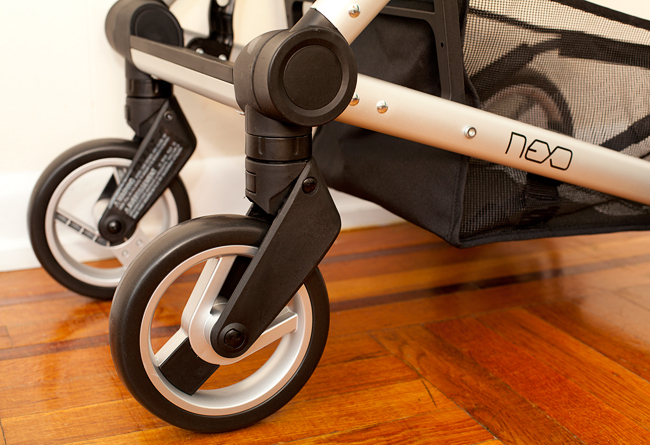 The Nexo can be used as a travel system with car seat adapters, which are sold separately. This is a very affordable stroller, retailing for $299. It is available in two beautiful colors; Blue melange and Grey melange. Both colors are accented by cognac color leatherette. We've been using the Nexo for the past two months and have gotten to know it quite well. If you haven't done so yet, you can check out my "Nexo Unboxing" and "Out and About With Nexo", picture-full post, before proceeding to the full review. 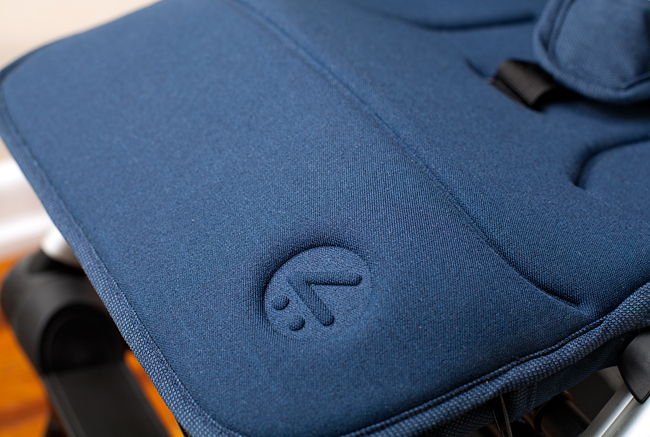 Folded dimensions - 17.3" x 20" x 25"
Handlebar height - 36" to 40"
Seat edge to foot rest - 9"
For a compact stroller, the seat on the Nexo is quite roomy. The width and depth of the seat are perfectly comfortable for both Ben, age 3.5 and Abby, age 20 months. The backrest measures 20" and this is where Ben is close to outgrowing the stroller. While he still fits in the seat, the canopy feels too close to his head. The seat has a one-hand recline lever which regulates the strap recline. While the recline is advertised as being a "true flat recline", in actuality it is not completely flat. It is low enough for a newborn, but I just wanted to mention this point for the sake of accuracy. 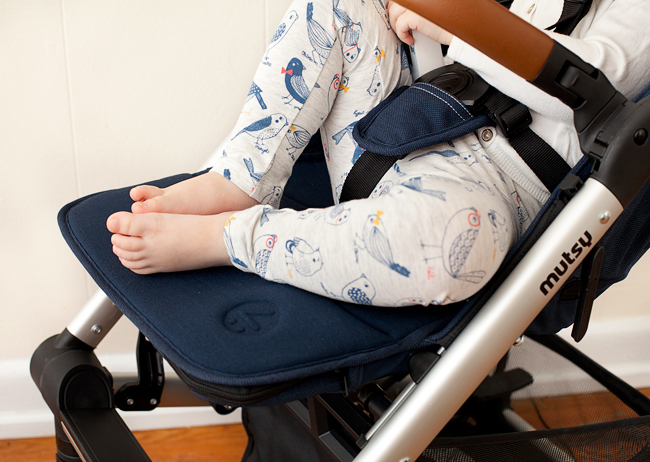 In the most upright position, the backrest is not completely upright, which sometimes annoys my kids, who usually like to sit up straight, or even lean forward in the stroller. Little Missy hated being strapped in with the shoulder harness because it pulled her back into a semi-reclined position. She tantrumed until I gave up and let her be buckled only with the lower harness straps. The seat has a leg rest, which adjusts to two positions and allows kids to stretch out comfortable for a nap. I absolutely love the design of the Nexo leg rest! To pick it up, all you have to do is lift it with your hand and it locks into place. Lowering the leg rest can be done with one hand, by squeezing a metal bar located underneath. 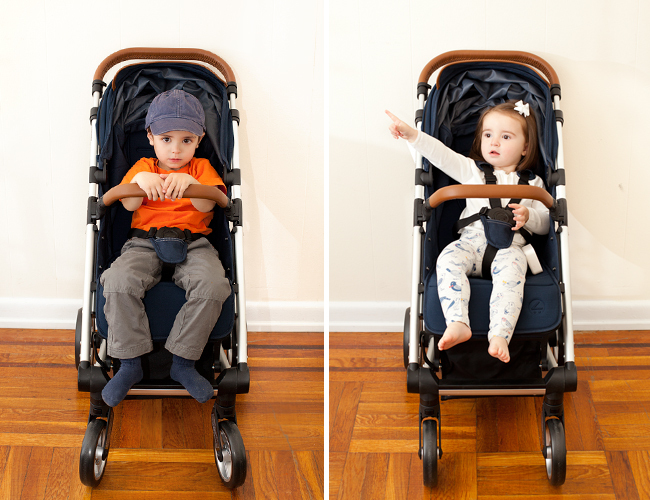 This is pretty innovative, as most strollers have two buttons on either side that need to be pressed simultaneously in order to adjust the leg rest. Another nifty feature is a hidden zipper compartment inside the leg rest. 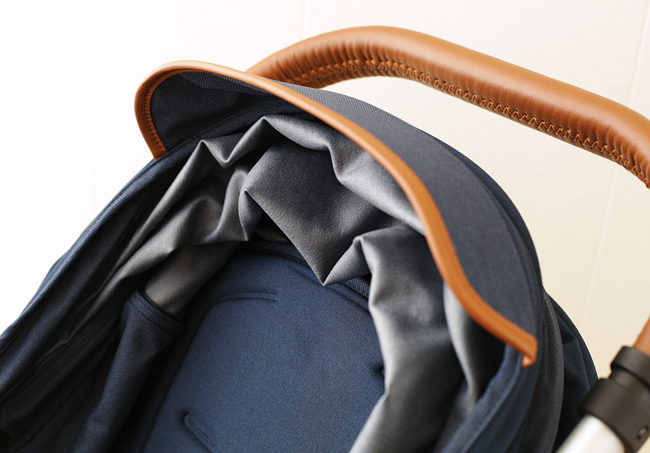 The compartment holds stiff fabric borders, which can be snapped into the inner sides of the stroller, turning the seat into a cozy bassinet of sorts. 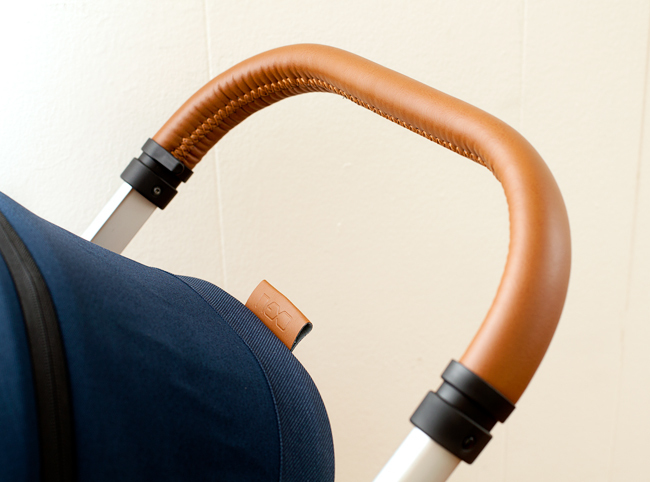 This extra feature is a really nice addition to the stroller, but of course, even in the bassinet mode, parents need to buckle in their infants in the seat. The seat also has a beautiful, cognac color, leatherette covered bumper bar with gate opening on both sides. The bumper bar can be removed entirely if necessary. Again, an extra bonus on a compact, affordable stroller. Some Nexo users complained of the recline lever occasionally popping out of it's bracket. 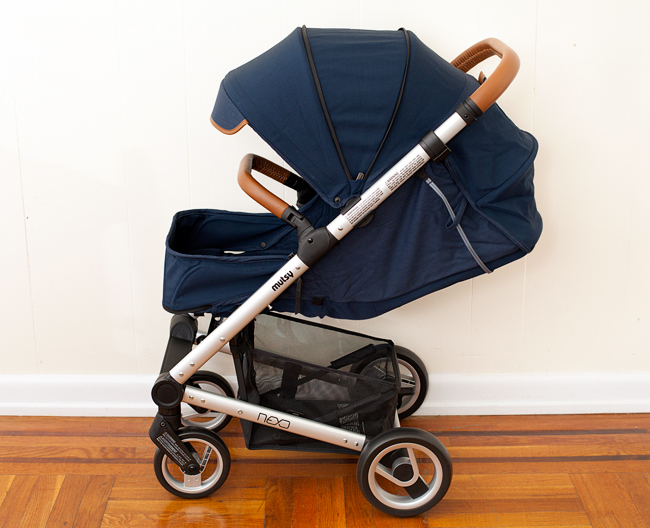 This does not happen on all Nexo strollers, but if you experience it, don't panic. It does not mean that the recline mechanism is broken. All you need to do is slide the toggle back into place. The straps responsible for supporting the backrest puzzle me. They seem rather flimsy, with one end simply stitched into the side of the seat. I feel that Mutsy could have done better in this area. Update 10/9/16: Since posting the original review, I've learned that Mutsy has worked on reinforcing the recline straps in the later Nexo productions, making the stitching extra strong. I'm glad! 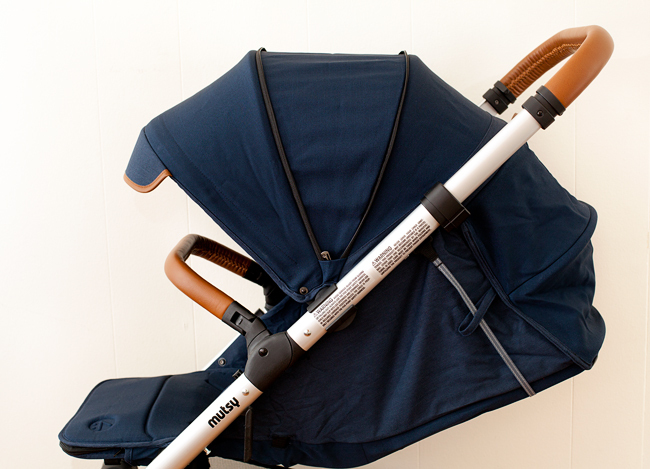 The Nexo has a gorgeous, extendable canopy with a sun visor. 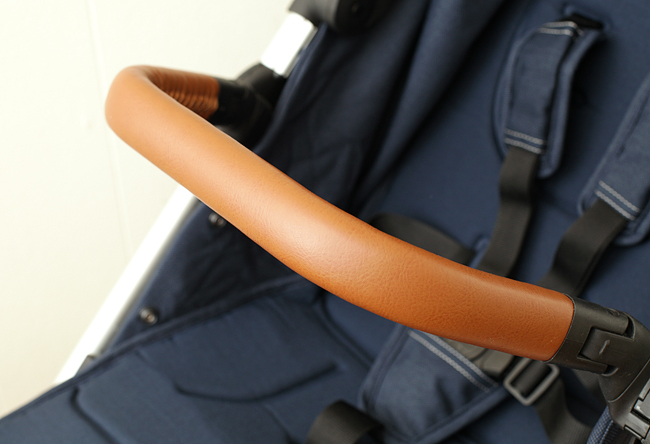 There is leatherette detail on the visor, which adds to the posh look of the stroller. The canopy unzips to reveal an extra panel, and when fully extended, provides ample protection from the elements. I really appreciate how the canopy fabric remains well stretched when the hood is open. The canopy is lined in some sort of a rubberized material, which I'm assuming makes it water-proof, but detracts somewhat from the overall high-end Mutsy look. I also wonder if the rubberized lining makes the canopy less breathable and without any ventilation openings, this may be a concern in hot climates. The back of the canopy is attached to the stroller with a bunch on snaps. I suppose, those can be unsnapped on a hot day if really necessary, but there's no place to attach the extra fabric to keep it out of the way. Plus the snaps are very tight and a pain to open and close. I don't think Mutsy really intended us to do that. Unfortunately, there's no peek-a-boo window on the canopy. While it's not a huge deal for toddlers, I imagine the lack of peek-a-boo window being disappointing for parents of infants, who'd want to be checking up on their precious bundle. The seat and canopy textiles looks and feels luxurious.The fabric on the seat is soft and pleasant to the touch, however, it is not as durable as I had hoped. The seat fabric snags easily, so you have to be cautious. I'd recommend using a stroller liner to protect the seat. The fabric must be spot cleaned, since it's attached to the frame and there's no way to remove it for cleaning. 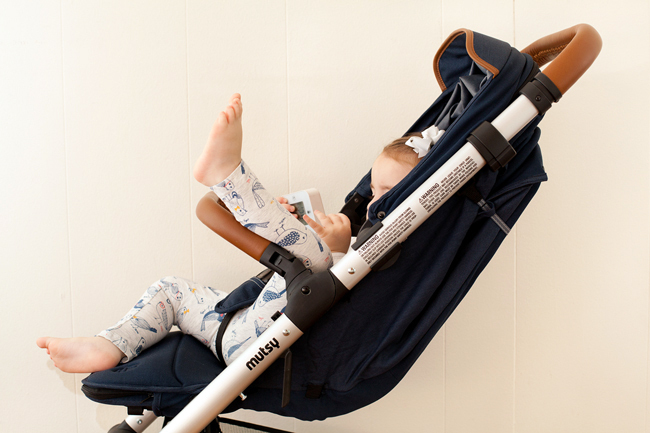 Nexo has a 5 point harness that can also be separated into a 3-point for older toddlers. 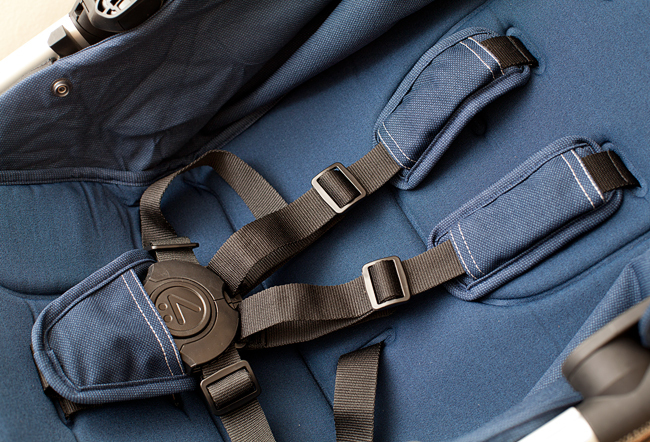 There are 3 shoulder strap height slots and two crotch strap slots. The shoulder strap pads are attached, so they don't slide down. The harness is tag-less, meaning no extra straps hanging down. The buckle is rather disappointing, as it's very hard to undo. It takes me a few presses and a few good tugs to release both sides of the clip. The push on the Nexo is fantastic! 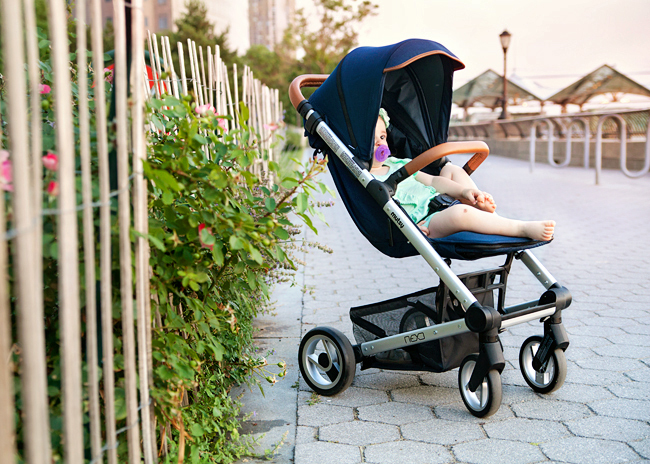 On pavement, the stroller is extremely agile and steers effortlessly with one hand. Nexo is equipped with all-wheel suspension which you can feel cushioning the ride and absorbing bumps. Ben, who at age 3.5 never sleeps in strollers anymore, actually passed out in the Nexo, which is a testament to this stroller's soft ride and comfortable seat. Because Nexo is very narrow and has a small foot-print, it's a pleasure to maneuver in tight spaces. Think small shops, public transportation, post office, etc. The stroller has good curb pop. Pressing on the handlebar, will raise the front wheels. Actually the curb-pop is a little too good. You don't want to suspend anything heavier than a diaper bag from the handlebar, especially when the seat is reclined, because the Nexo is prone to tipping over when the weight distribution is shifted backwards. Nexo has a telescopic, leatherette covered handlebar, which can be adjusted to 4 height positions, from 36 inches from the ground to 40 inches. Again , such a range of adjustability is rare on a compact stroller in this price range. The thread that was used to hand-stitch the leatherette cover is somewhat rough as compared to other strollers that I own with similar stitching. The wheels are made of low maintenance EVA plastic and perform best on city pavement. The front wheels measure 6.5" and the rear wheels are 8". 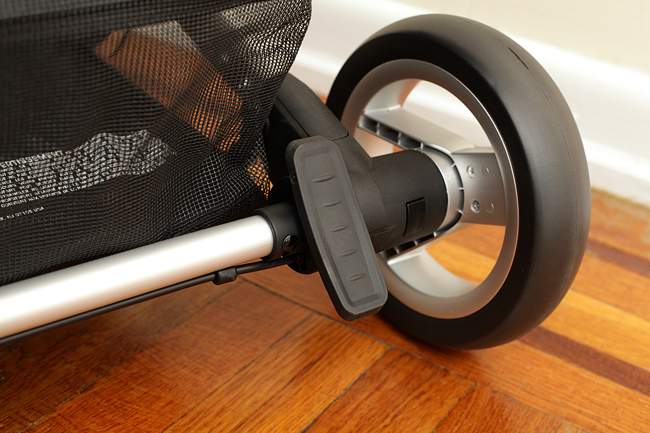 The front swivel wheels can be locked in a forward only mode, by turning the plastic knob at the joint. In the swiveling mode, the front wheels are quite loose and rattle when going over bumps and cracks in the pavement. This is pretty common, but of course not the ideal scenario. 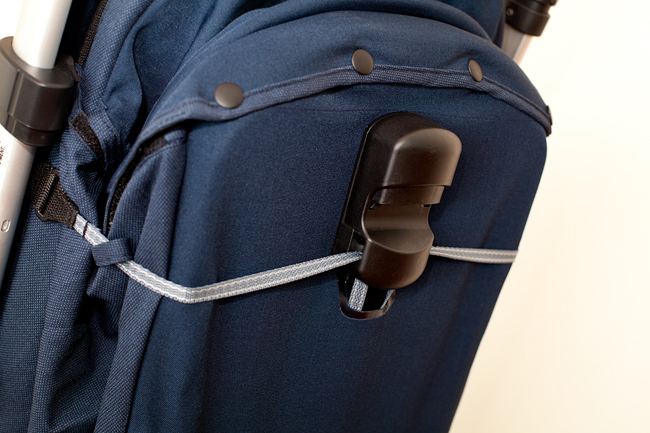 The wheels are "quick-release" and can be popped off for even more compact storage. Nexo has a small pedal break on the right side, which locks the rear wheels. The break makes and audible click when engaged. 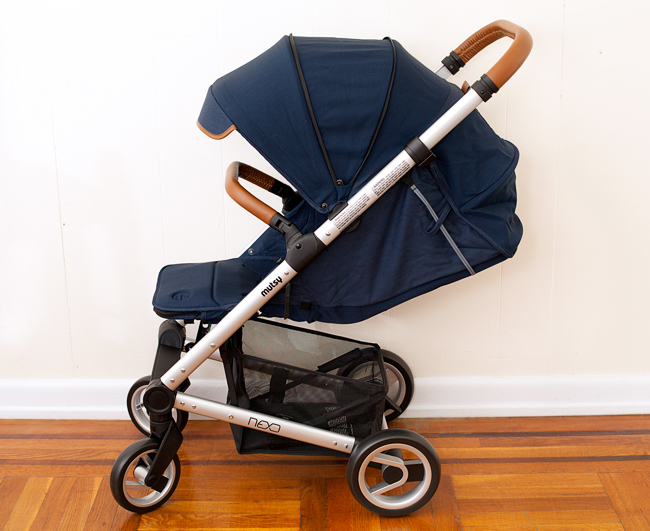 Due to Mutsy's unique, < shape frame, the under-seat basket is very easy to access on all Mutsy strollers, Nexo included. Because the Nexo is a compact stroller, the basket is not huge, but it's certainly larger than on your typical umbrella stroller. 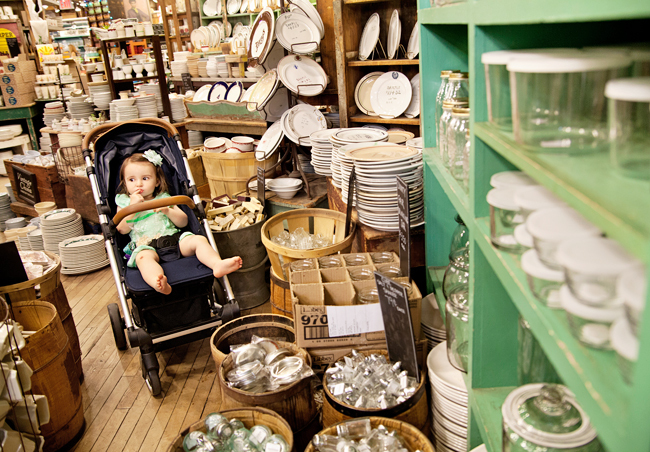 The basket has a reinforced, hard bottom and can handle a reasonable amount of stuff. I've read some reviews where Nexo owners complained about the durability of the basket, but I think they've underestimated it's full potential. I wouldn't abuse the basket, but I did manage to bring a large box of diapers home in it. Nexo has a 2 step fold. It needs to be done with both hands and feels a little awkward at first, but becomes very intuitive with practice. 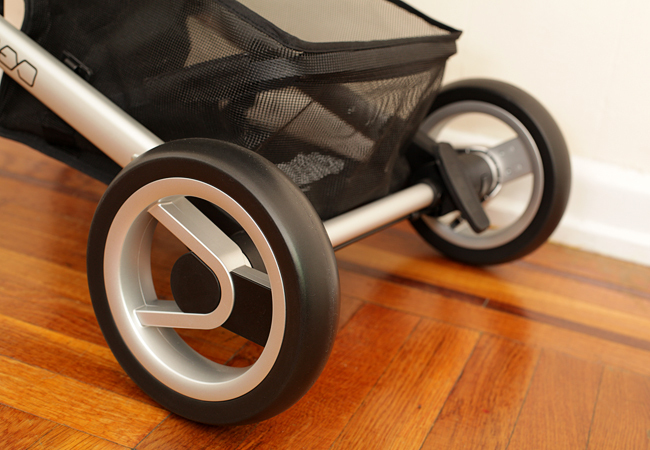 The folded stroller is super compact, making the extra folding step worthwhile. 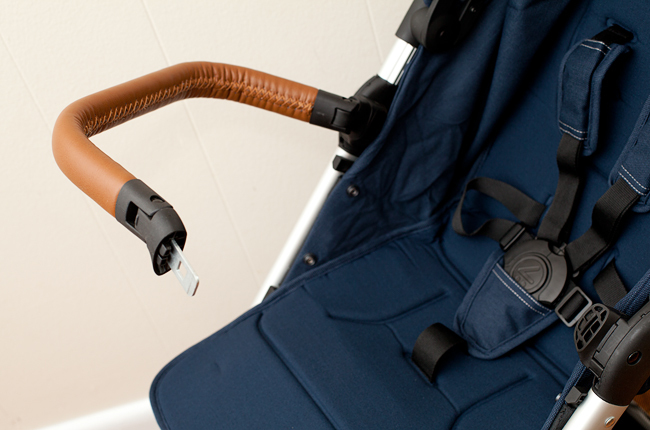 There's a fold lock, but it doesn't always catch, so you need to check up on it and squeeze it into place, before lifting the folded stroller. 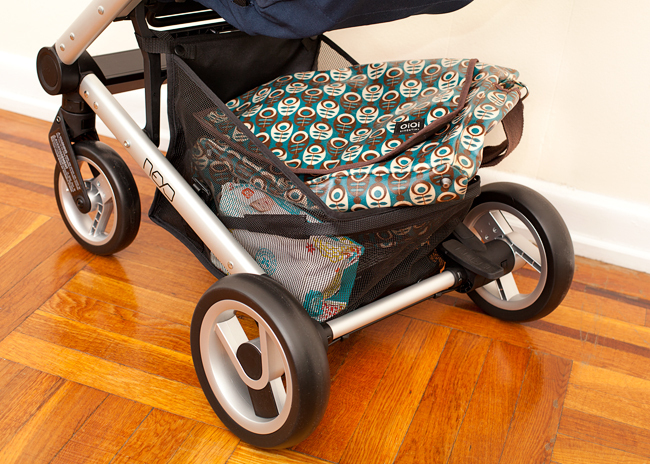 The stroller stands on it's wheels when folded and can be rolled along that way as well. 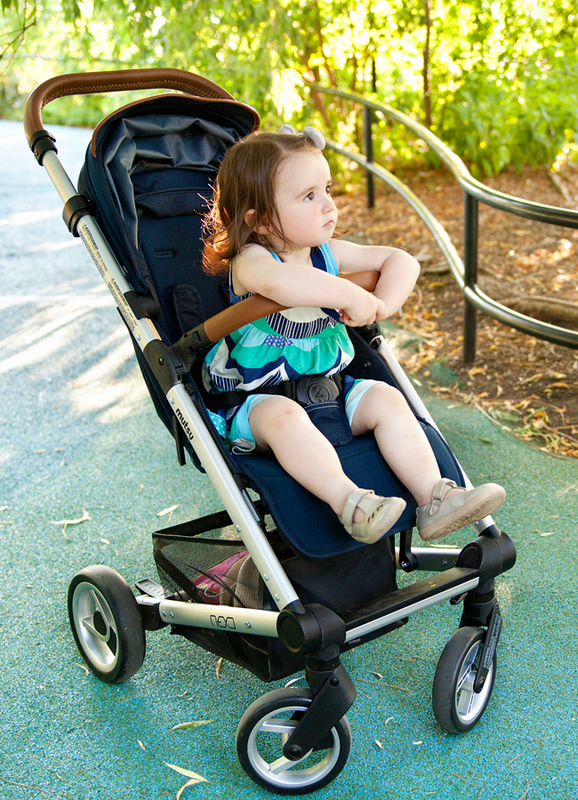 To unfold, you need to locate your fold lock, which is tucked away between the handlebar and the side of the stroller, release the lock, pull out the handlebar and shake the stroller open. You will hear a click when the frame locks into place. 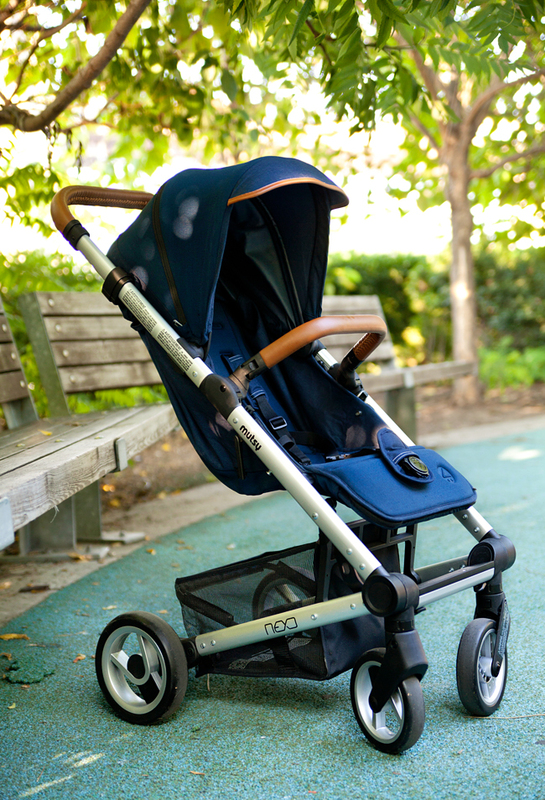 The Nexo is a gorgeous little stroller that's made with many convenient features. 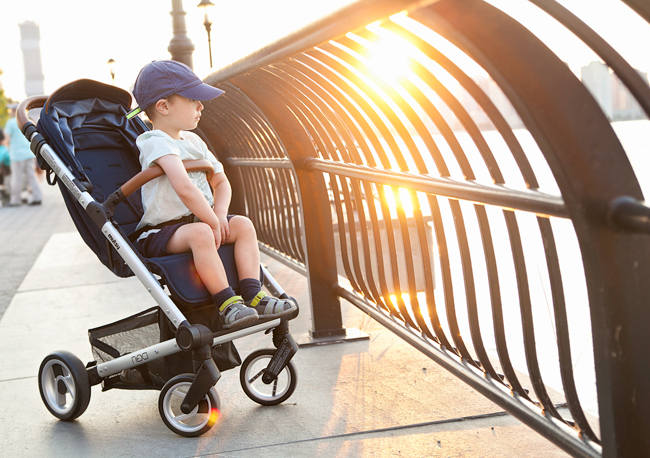 This is a great stroller to use around the city and to take along on trips. The seat, with it's deep recline and adjustable leg rest, is very comfortable for infants and toddlers alike. 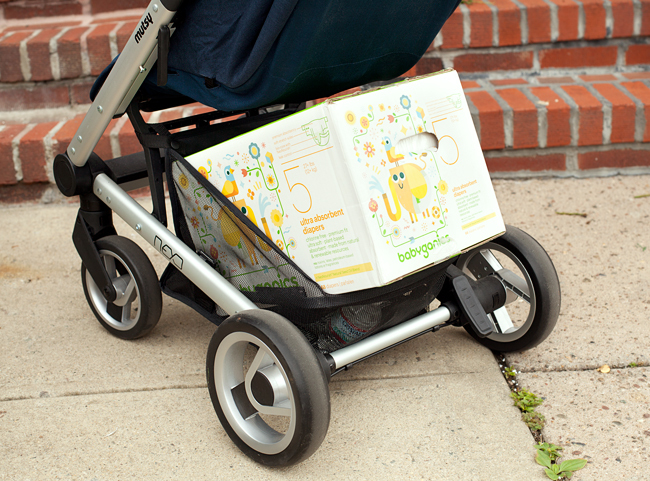 The compact fold means the stroller doesn't take up too much room in your car trunk. I absolutely love the all-wheel suspension and the superb maneuverability! This stroller really has a lot to offer, considering it's price and it's compact size. As you can see, Nexo's great features certainly outweigh the few cons. 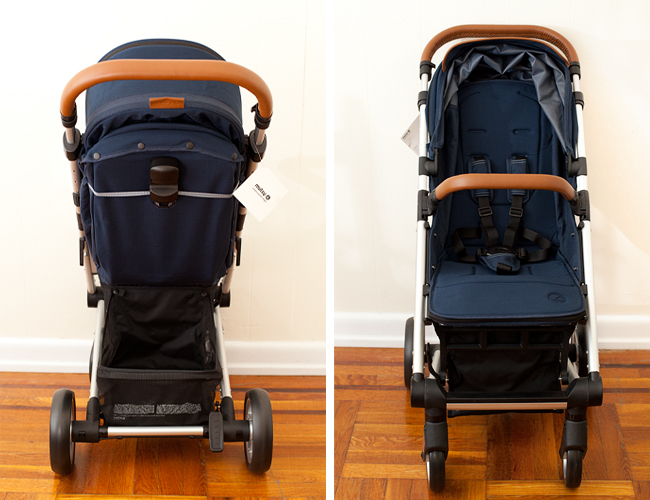 This could have been a perfect urban stroller, if it didn't come just a tad short in the quality department. I would love to see the Nexo updated in the future with a more robust recline mechanism, a better harness buckle and more durable fabrics. I decided to give Mutsy Nexo a 4 out of 5 stars rating. Please keep in mind that I have very high standards and only review strollers that I would want to use with my own kids, a category which Nexo surely fits into. I'm happy to report that since posting this review, I've learned that Mutsy has fixed most of the quality issues in the Nexo. It seems that my stroller is from the first or second production and Mutsy has already addressed the glitches I've mentioned in the review. Throughout the year, Mutsy will continue to make improvements to the Nexo, based on consumer feedback. As of now, the play on the wheels, and hence the sound, has been greatly reduced. The buckle release will be improved as well. The recline straps have already been strengthened. I'd like to thank Mutsy for sending the Nexo for this review. As always, all the opinions are entirely my own.